Gratuitous photo of our one-year-old! I’ve yet to experience the joy of half-terms as a parent (with a one-year-old at home it’s like a permanent half-term here! ), but with days out, time off work and the need to keep kids constantly entertained, I’m expecting it to be expensive. Research shows that the average household spends £30.80 on dining out per week – but this February half-term, you’ll be able to cut the cost of a family meal out at various restaurants across Bristol. 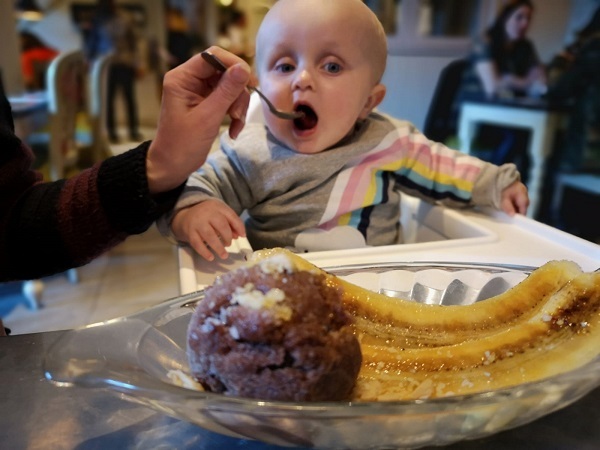 Las Iguanas: (Harbourside and Cribbs Causeway) – free niños meal with every adult main meal ordered (main, 2 sides and a dessert from the kids’ menu), along with a free book. Runs from February 16th-24th. Loch Fyne: (Queen Charlotte Street, BS1) – one free child’s main course from the children’s menu with every full-priced adult main from the a la carte menu purchased. Child’s starter or dessert can be added for an extra £2. Runs from February 16th – March 3rd. Bella Italia: (Baldwin Street, Cabot Circus, Cribbs Causeway and Filton) – ok, so it’s not free, but kids can enjoy a Piccolo or Grande meal for just £1 when a full-priced adult main is purchased. The offer is valid from 12pm every day except Saturdays, and runs till March 24th. Yo! Sushi: (Cabot Circus and Cribbs Causeway) – for every adult who spends £10, one child can eat free (a starter, a main and a drink from the kids’ menu). Runs from February 16th to March 3rd. Prezzo: (Anchor Square) – Kids can enjoy three courses and a drink for £1 – you need to download the voucher. Runs until March 3rd, excluding Saturdays and Valentine’s Day. Brasserie Blanc (Cabot Circus) – free children’s menu for one child when an adult orders two courses from the a la carte menu. Runs from February 16th to 24th. Don’t forget to take advantage of the free kids’ meals offers that you’ll find at other restaurants too – not just for half-term! The post Children eat free this February half-term in Bristol! appeared first on Bristol Bites. Next PostNext who else our city is a amazing place to Explore?